I must first mention my night last night before I can go into my day today. For starters, I had to go to bed early because it was wakie wake at 4am for work this morning. Well thanks to all the Halloween commercials I got very scared in my bed last night. I was so scared I could not go to sleep, so I was awake all night long. It was awful. Every time I got settled something would go bump in the night and I would get all worked up again. Needless to say I finally got calmed down about 3am and there was not much hope for a good nights sleep. So 4am when the alarm I finally got out of bed and just decided to leave the scary house and go to work. Well, I got up and started drinking my water....that's part of the raw foods diet, 1-2 liters of water before the day starts. While drinking my water I was making my very first ever fruit smoothie. Real fruit, real juice, ice and some yogurt for texture. I have never made one of these before so I was taking my time making sure I got everything right. I actually had to steal a blender from my Mom because I don't have one. So I got all the stuff mixed together and started blending. Well the blending stayed pretty low in the blender so I decided to take the top off and use a spoon to get everything all mixed together really well, I hate hunks of ice in a smoothie. In the midst of my blending with no top a huge chunk of ice got stuck in the blade and the smoothie exploded!!!!!! I don't mean just barely, it was all over the floor, the counter tops, the cabinet, and even the ceiling. When I say everywhere I truly mean everywhere. 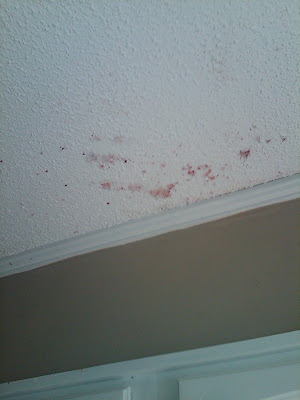 That is the ceiling above my blender this morning....the only place I cant get clean. ﻿So after the blender explosion and the clean up I finally headed off to work. I knew it was going to be a tough 6 hours because of the lack of sleep. While on my way to work I looked down at my speedometer, I had to do a double take and just couldn't believe what I saw. 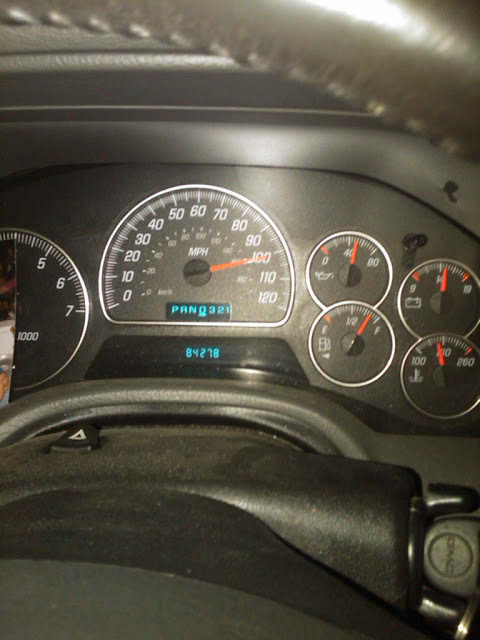 My speedometer said I was doing 110mph. I knew it had to be a mistake because I don't drive fast hardly ever, and I most certainly don't do 110 mile per hour, ever! Really I did take a picture because I knew no one would believe me when I told them about it...and I know when I take it to the shop it wont do it again. Now all this was before 5am. The 6 hour work day actually went by pretty quickly today and then it was off to the ball games. Opening tourney for the basketball season....WOO HOO! I had a blast at the game, an amazing come back game. Then it was finally time to nap, and sleep came much easier today, with day light and not so many scary noises as during the night. All that being said, I did really good on my diet today. I packed all my food for breakfast and lunch and then I struggled tonight. My church does a wonderful event called Trunk or Treat where kids can trick or treat in the parking lot in the church, and they take it to a whole new level. We had candy, games, food, the whole shabang.....and without a healthy option I ate a hot dog for dinner and some candy. I know I shouldn't have but I did really well the rest of the day so we will just count that as the 20%. I am still liking this diet pretty good. I loved my fruit smoothie this morning and other than the slight (massive) explosion and the amount of seeds left in my teeth it was delicious and filling. I could get used to eating that for breakfast every morning. I wish I hadn't eaten poorly for dinner but that falls into the category of life and it goes on diet or not. Tomorrow I have one more Halloween party and this is the best one of the year, costumes and fun. I will surely have pictures for you. Hope you all have a safe and Happy Halloween. I cant wait to show you guys the costumes that we can come up with....sometimes they are too much to handle. I cringed when I saw what happened (it happened to me once too, and it's a pretty wild clean up). I love smoothies and have them every day. I enjoy them immensely. I put a 1/2 scoop of protein powder in too... Happy Halloween!! !